The 2010 Olympic partners, including the Province of British Columbia, made important social commitments in order to become hosts of the 2010 Winter Games. These included promises to build more social housing, and to prevent increases in homelessness. Yet BC has the highest poverty rate in Canada, and there are more than 2,000 homeless people in Greater Vancouver alone. The 2010 Olympic partners, including the Government of Canada, made important social commitments in order to become hosts of the 2010 Winter Games. These included promises to build more social housing, and to prevent increases in homelessness. Yet today, BC has the highest poverty rate in Canada, and there are more than 2,000 homeless people in Greater Vancouver alone. Set national standards for welfare, to make sure every Canadian can get help during hard times, and avoid becoming homeless. Create and fund a national housing and homelessness strategy. Work with the provincial and federal governments to implement the Inner-City Inclusive Housing Table’s recommendations — in particular, increasing welfare rates by 50%, getting rid of arbitrary barriers to getting welfare, and building 3,200 units of social housing by 2010. Put a moratorium on the conversion and closure of residential hotels that are the home to about 5000 low-income residents. Freeze condo development in the Downtown Eastside until homelessness is ended, and good quality housing is available for current residents. 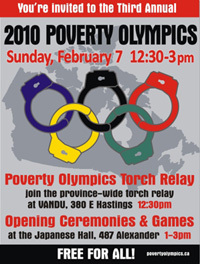 Tell a friend… Help spread the word about the Poverty Olympics!